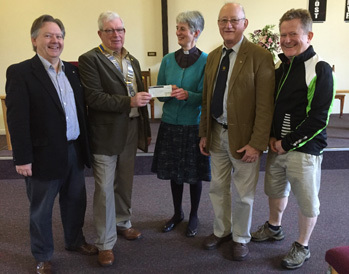 Rotary Biddulph is grateful for the on-going support of the Biddulph Methodist Church and the Victoria Centre. Over the last few years, the Victoria Centre has opened its doors to the Rotary Club to enable it to hold their annual ‘Youth Speaks’ event at the Centre, when children from Biddulph schools take part in a public speaking competition as part of a National Rotary Youth Speaks Competition. The Victoria Centre also hosted, for the first time this year, the annual Rotary Acorn Award ceremony. This event recognises the achievements of the youth of Biddulph in accepting nominations for those who are deemed to be deserving of public recognition for their individual, or team, achievements during the previous year. This prestigious award ceremony is held annually in May each year and following the success of this year’s ceremony, will again be held at the Victoria Centre in 2016. The Victoria Centre which is run by the Reverend Pam Butler and the stewards of the Methodist church, hosts an ever increasing number of community events, such as the Coffee Morning, held every Friday, and the Mums and Toddlers morning held each Monday and Thursday. Back in May 2104, under the guidance of conductor Sue McAllister, the centre formed The Biddulph Community Gospel Choir. The choir rehearses each Friday between 7.30pm and 9pm at the centre and anyone who enjoys singing and would like to try a session with the choir, is invited to come along for ‘a taster’ on any Friday. The choir will be ‘out and about’ during the Christmas festive period and will be with Biddulph Rotary for Santa’s arrival at Sainsbury’s Biddulph, on Saturday 19th December at 4.30pm, after Santa Claus finishes his tours of Biddulph on his Sleigh. Rotary Biddulph President, Dave Ash, thanked all at the Victoria Centre for the support given to Rotary over the last few years saying that Rotary Biddulph was looking forward to working closely with the Centre in the forthcoming year and hopefully for many years to come. The Reverend Pam Butler expressed her thanks for the financial donation which she said was already earmarked towards on-going running costs.